My name is Alison and I live in Pittsburgh with my husband and three chickens. I love making things. I can sew, cook, solder, and program. I spend most of my free time making messes. My chicken Mary is special. Well, not “special”, but extraordinary. She’s not as big as her sisters and her feathers are a little more red than what is usual for a Rhode Island Red, but she also has a unique ability to tolerate having her picture taken. While Catherine and Elanor will peck and squawk when compelled to stay still, Mary takes it all in stride. Catherine and Elanor will walk immediately out of view range of my cacmera, but after being put back in place once or twice Mary will just stay and wait until you are done. She’s behaved this way ever since we adopted her as a wee chick. I decided to press my luck today to see what we could accomplish with Mary’s unusual amount of patience. I decided to enter her in the New Yorker’s Critterati Contest, a competition to see whose pet makes the most convincing literary figure. I swear that I’ve never dressed up a pet before; I’ve always felt bad for dogs in sweaters. Mary has never worn a hat before, at least not a real one. I don’t know, I felt…compelled to see if I could pull this off. I decided to make a chicken-sized Genji Monogatari costume. There would only be two pieces needed to set the character and both were relatively easy to make. The hat took a few minutes to fashion out of felt and a rubber band. The robes were a cinch to make out of scrap fabric. The question would be whether they would fit and whether Mary would tolerate wearing them without freaking out. I waited until nightfall; Mary is a lot more comfortable being handled after dark. Saralinda was on hand to assist and hold up the background. After some initial resistance, Mary acquiesced to wearing the costume. She really knocked it out of the park. In fact, she did so well that I was kind of freaked out that she could stand still for that 5+ minutes while wearing something completely foreign to her. I took lots of shots while my friend Saralinda held a posterboard behind her. We took a video just to show how still and regal she was. 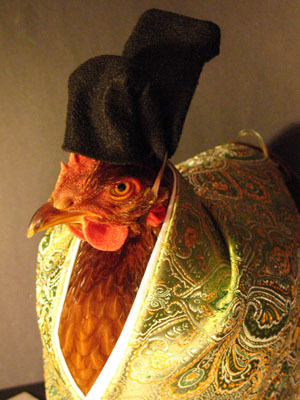 That, and to prove that we didn’t just Photoshop a hat onto a picture of a chicken. I ended up really apologetic because her stillness was just so eerie. Of course, she was happy to toss off the costume herself the second we stopped taking pictures. She was compensated handsomely in the end. *UPDATE* Mary was one of the winners chosen by the judges! Yay for Mary! It’s time for another Make-A-Skirt Thursday! The weather has been turning chilly, so I’m switching to warmer fabrics, namely corduroy. It’s one of my favorite fabrics to work with. Despite its ability to keep out the winter chill, it’s also breathable and wearable in summer heat. There are two things I love when it comes to skirts: A-line silhouettes and pockets. Simplicity 3754 has both, but the pleats under the pockets are a bit much for what I want, and I already have two skirts with that detail. So, I took the slim skirt and flared it out into the shape I had in mind. 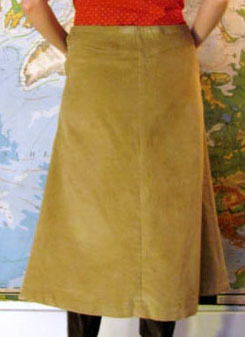 I also plan to wear this skirt in conservative Egypt, so I lengthened the hemline a little. I edged the pockets in navy blue twill to give it a little character. The back came together really well. The pointed yoke has been a pain in the past, but this is my third time with this pattern and I managed to get it right on the first try. I put this skirt on as soon as I finished. It’s been cold in the house during the day, but we can save money on heat if I dress warmly. I think this skirt will probably pay for itself a few times over in gas bill savings. I fully recognize that I’m not talented when it comes to drawing and painting. I spend a lot of time doing both because I enjoy them, but I usually end up drawing cartoons because I’m terrible at drawing things from real life. Still, I’ve learned some shortcuts so that I can make nice things without getting mad at myself for my inability to translate real things to paper. My favorite technique for making me look like I have more talent than I actually do is to make watercolor leaf paintings. The sneaky trick is to find a bunch of really pretty fall leaves and then trace them. Once that’s done it’s really easy to draw in the network of veins and suddenly I have a decent drawing from nature. I usually draw on in plain white index cards. They’re the perfect size to give away as thank you cards and the limited size keeps this project short and sweet. Next I put down an initial wash of color. It’s okay to color outside of the lines because it’s nature and nature is messy. For real, yo! Next, but on a second coat of contrasting fall color. It will look weird at first, but through the magic of watercolors the washes will blend and dry in a way similar to leaf coloring. Put on subsequent washes of color over smaller and smaller areas to give the leaf depth. With practice it’s easy to do a bunch at a time and spend less than ten minutes on each. Now that the domestic peach crop is coming to a close for the year it’s time for me to make my own f***ing canned peaches in the true old-timey tradition. So, my mother was one of 18 children, and I feel like a lot of information that was held by my grandparent’s generation didn’t have a chance to get passed to the people in my mother’s generation, and, in turn, didn’t make it to my generation. I don’t blame anyone for that, and I feel lucky that my grandmother’s intense sewing skills made it down to me, but I still wonder how much information was lost because my grandparents were so busy raising baby after baby that there was no time to teach the older ones the kind of skills that go from parent to child. In summary, I have no idea what I’m doing. I’ve never canned anything before, and I’ve never even seen anyone can anything. Luckily, I have the internet to make up for this gap in domestic knowledge. I have resources to learn this new skill and hopefully I’ll have the wherewithal to pass it on to the people will come after me. Still, mistakes will be made, lots of them. First, I removed the skins from the peaches. I placed each in a pot of boiling water for 30 seconds and then placed them in ice water. The skins popped right off. I had no idea how many would fill a jar, so I skinned four large, ripe ones. Next, I made a simple syrup solution of half sugar and half water, heating until the sugar completely dissolved, not letting the liquid boil. I then cooked my peaches in the sugar syrup for about five minutes, still keeping the solution from boiling. I then put spooned my peaches into a canning jar and used a funnel to fill it up to the top with syrup. My peaches only filled half of the jar, so next time I’ll need to cut up more than four. Finally, I boiled the jar to seal it. I learned a few hours later from a friend that the water should be over the lid of the jar or the jar should be boiled upside down. Still, it sealed and seemed intact. I guess I’ll find out whether I really screwed up in a week. **Update** I let the peaches sit in the cupboard for a week before trying them. They were super tender tasty! I think I’ll cut down on the sugar in the syrup next time because it was way to sweet, but I’ll probably use the leftover liquid to make peach sweet tea. Well, I had about three big salad bowls of pumpkin guts leftover from yesterday and it’s a shame to let that all go to waste. I spent a good chunk of my day slimed up to my elbows pulling out the seeds one-by-one. It’s not my favorite activity, but my frugal nature dictates that if there is something good to eat somewhere in a bucket of goo, I should find some way to get that good thing out and edible. So after straining pulp for about 45 minutes I ended up with wrinkly hands and a strainer full of seeds. I rinsed all of the remaining guts off and spread as many as I could on a greased cookie sheet in one layer. They’re really sticky after rinsing, so be prepared to have a few cling to your hands no matter what you do. Luckily, they come right off in the sink. Using this recipe I baked them at 375 for 25 minutes. I shook the baking sheet about 15 into baking to keep the seeds from cooking together. I ended up with more roasted seeds than we could ever eat. Luckily, pumpkin seeds are good for chickens. They’re supposed to be a natural de-wormer. I hosted a pumpkin carving party today. We purchased too many pumpkins and then spent what seemed like forever cleaning out the guts and seeds. Those fancy white pumpkins are especially stubborn about getting cleaned out; I think I’ll stick to orange ones in the future. I used some of my Lino block carving tools to do a multi-layered pumpkin, using the skin as one color, the exposed flesh as another, and the fully carved through areas as the last one. I learned that you really have keep the exposed flesh in a thin layer just to have the light of the candle make it through. There was a lot of cursing from me, but few accidental stabbings, so I came out ahead. It’s not the cleanest space alien pumpkin carving, but not bad for an hour of actual work. Sukiyaki is a meal Clark and I like to cook for friends. It’s a good example of a regular meal Japanese people actually eat at home, unlike teriyaki chicken or California rolls. It’s also one of those meals that guests cook themselves, like fondue, although Sukiyaki is less likely to be a source of high cholesterol. It’s also kosher non-dairy, gluten-free, and not too hard to make vegan, so it’s a good meal if you’re entertaining in a pinch and you don’t know what dietary needs are going to come out of left field. The most time-consuming part of preparing the food is all the chopping. Our typical version will have cubed tofu, chopped cabbage, mushrooms, sliced carrots, thin wedges of Kabocha (Japanese pumpkin), and chunks of green onion. We’ll buy additional ingredients like yam noodles, sukiyaki sauce, mochi and thinly sliced meat from the Japanese food store, but they don’t need much preparation. The meat is even pretty cheap because it’s in such small slices, so it doesn’t take much money to feed 8-10 people. We use a camp stove in the middle of the dining room table to cook the food. First we pour in the Sukiyaki sauce* and let it simmer. Then we add veggies and let them start cooking. The meat is so thin that it cooks almost instantly. When things are done cooking, people just grab what they like, adding more from the veggies or meat as needed. After the stock boils down we add the yam noodles and enjoy the rest as a thick soup. Traditionally, morsels taken from the pot are dipped into individual bowls of raw egg and eaten over rice. It’s optional and often Clark and I are the only ones at the table to eat our Sukiyaki that way, but despite the fear about salmonella, it adds an extra level of tasty. It’s soooo, good, especially the gooey chunks of mochi and the kabocha once it gets soft. I love eating this dish during the fall and winter. The windows usually fog up from the steam and the temperature in the house rises 5 degrees. It’s just a cozy, friendly meal. There were some very lovely fabric stores in San Diego. I *heart* Rosie’s Calico Cupboard. It’s huge and crammed with lots of designs that I’ve never seen before, all nice 100% cotton. Clark even got into the spirit and purchased a yard of fabric in order to make a new pillow case. I’m usually bad about mending things or making things he requests in a timely manner, so I made a concerted effort to give him what he wanted. Pillow cases are one of the easiest things to make, ever. They’re just a rectangle sewn on three sides and then cuffed and hemmed on the remaining side. I made mine in about 20 minutes. I used one of our old pillow cases to measure out my new one. Unfortunately, one yard is not quite enough to cut out a case with the butterflies flying in the correct directions. Our butterflies look a little disoriented. When you measure out your fabric make sure to cut a few extra inches on one end for the cuff. After you sew up the three sides, just fold up the extra twice and sew it in place. Oh, I should note that I used a serger to finish my seam edges. I would recommend using some kind of seam finish so that the case won’t unravel when it gets thrown into the wash. I love making circle skirts when I have fabric that is at least 59 inches across. They can be cut in just one piece if you buy two yards. That means that just the waist and hem need to be finished in order to leave you with a finished garment. Plus, circle skirts are great. Swish. Swish. Swish. Cutting out a circle skirt isn’t hard. You’ll just need a yardstick, some chalk and a little patience. First, fold your fabric to find the center point. Mark that. Now, if you have two yards of fabric, it should be 72 inches long and (ideally) about 59 inches wide. If you want to go for the maximum length*, then mark the edge of the fabric 29.5 inches across the width in one direction and 29.5 inches in the other. Now, mark 29.5 inches from the center across the length at a 90 degree angle from the two width-wise marks. Do that again for the opposite end. Now you will have a center mark and four additional ones laid out in a ‘+’ shaped configuration. Make some more marks to fill in the edge of your circle, pivoting the yardstick around the center mark and going out 29.5 inches. Cut along your marks. Now you have a giant flat circle that needs the center cut out so you can actually wear it. Measure yourself at your hips. This will be at least how wide the skirt must be so that you can step into it to put it on. To figure out how big it should be I used the circumference equation, circumference = 2πr. I substituted my hip size for the circumference and solved for r and got about 6 inches, so my diameter will be 12 inches. I cut the smaller circle out using the same center point technique as the outer circle. Fold down the edge of the inner circle to form a casing for elastic. Clip if you need a little give to make the casing lay flat, sort of making shallow sun rays from the inner circle. Sew in place, leaving a 1 inch opening. String narrow elastic through the casing and adjust so that the skirt sits comfortably at your waist; give yourself a little breathing room. Clip the extra elastic and sew the ends together. Tuck the elastic into the casing and sew the 1 inch opening shut. Finally, just the hem is left. Folding up fabric to make a hem on a circle skirt is always kind of a pain. It’s always annoying tying to ease in the excess fabric from the edge and it’s usually about nine yards of sewing. No thanks. Instead, my edge finish of choice is bias tape. It adds a little contrast and no easing is necessary. If you’re not familiar with sewing with bias tape I learned how to apply it properly from this tutorial. *I always recommend going for the maximum length at first. It’s easy to remove excess length, but not vice versa. We had a chestnut tree in my childhood backyard. It was by far out best climbing tree as long as you managed not to fall out of it and land on the spiky carpet of dried-out seed-casings. The burrs always had a way of splintering into the skin of our hands and causing all kinds of agony. The family dog gave the tree a wide berth. Most of the nuts, ~95%, were no good and filled with fuzz. The remaining ones could be collected, but only if you got there before the squirrels. One fall, with a eye towards finally trying our own chestnuts I went out daily and steadily collected an entire bucket-full. Unfortunately, I didn’t know what to do with them and neither did my family. They stayed in the garage for months until they were finally redeposited in the backyard. I’d never tasted a chestnut until I moved to Japan where they are a common train-station snack. The nuts have a natural slightly sweet taste. In fact, they have little fat compared to other nuts and are considered to be a good diet food for nut lovers. I found cartons of chestnuts for sale last week at the farmer’s market for cheap. Now, I will finally know what to do with my very own chestnuts. It turns out that making them edible is a pretty easy task. Heat an oven to 400 degrees. Slice the tip of each nut with a sharp knife to let steam out while baking and keep it from exploding. Bake the nuts for 10 minutes in a single layer on a cookie sheet. Shake and let them bake for another 10 mintues. Larger nuts will need a little longer, so test one before taking them all out. The shell should have split further from your knife cut and it should be easy to remove. Fully cooked nuts will be soft and warm all the way through. If the texture resembles a crisp apple when you bit into it, put it back in and bake for a little longer. You can eat them as-is or incorporate them into your favorite nut-meat recipe.